Maidenhead Aquatics at Oxford is one of our largest aquatic centers, with a huge outdoor are that is dedicated to water gardening. There is a strong emphasis on ponds and water features, with demonstration gardens at the rear and over half of the indoor area of the store given over to pond accessories and equipment. The store also has an impressive display of tropical fish and fancy Goldfish, with a large area devoted to dry goods and tanks and cabinets. 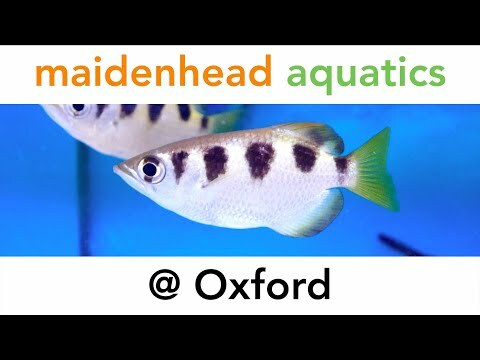 If you would like to check our current livestock availability, you can do so by visiting www.tropicalfishfinder.co.uk and clicking on Maidenhead Aquatics @ Oxford. There is a well-trained team of enthusiastic staff that are always on hand to give helpful, friendly advice on all aspects of fishkeeping and water gardening. Situated just outside Oxford and just one mile from Junction 8A of the M40, the store is easy to reach and has its own car park.